A week before the 7th. 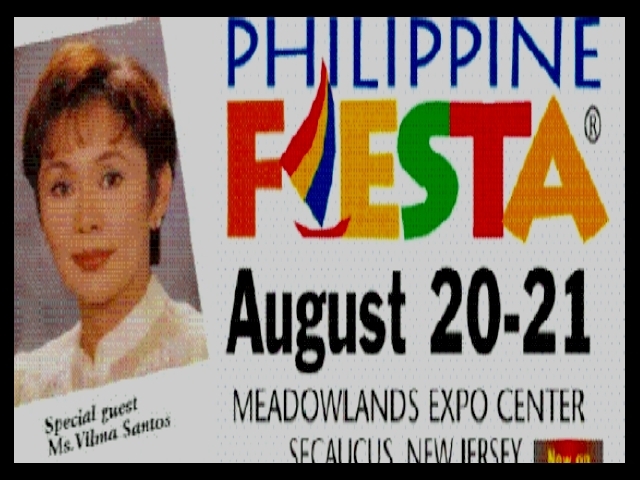 Annual Philippine Fiesta in America was held in New Jersey (August 20 to 21, 2005), featuring Lipa Mayor Vilma Santos-Recto as special guest, tropical storm Irene was spotted in the Atlantic Ocean and was predicted to become a hurricane that will hit the East coast. Record increase in the price of oil and gasoline are looming in the horizon. The weather was hot, hazy and humid and if it persisted, there will be evening thunderstorms. Either of the above would surely affect the attendance of what is considered the biggest annual reunion of Filipino-Americans in the East coast. Miracle of miracles, Irene veered into the ocean, and the weather was in the mid to upper 80s, just perfect. God must have smiled at Mayor-Actress Vilma, the Glad girl. Like a homing pigeon, the Honorable Mayor and the Philippines’ most awarded actress must spread joy to her fans in the East coast. Together with her husband Senator Ralph Recto, they conquered the hearts, minds and spirit of their assimilated, albeit homesick kababayans by gracing the annual Fiesta of trade exhibitors, international and local entertainers and cultural and food festival. Like Vilma’s movies, the weekend extravaganza was a box-office hit. 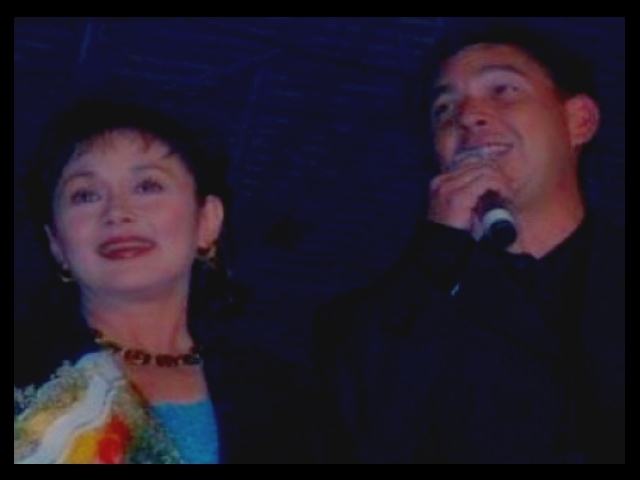 As per Alan Trambulo, NY President of VISION (Vilma Santos International Online Network), Pinoy Fiesta producers Nanding and Mila Mendez were more than pleased with the overall results of the 2005 Fiesta. “This is perhaps one of the best, even better than last year,” they chorused. 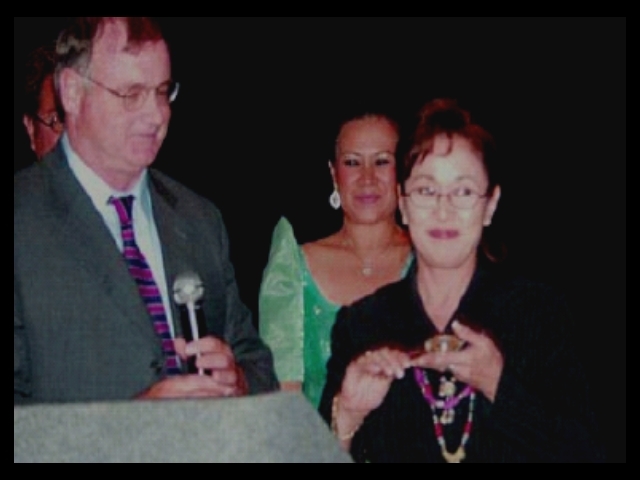 We were so happy and honored by Vilma’s presence. She is very professional, madaling kausapin, and very concerned about the outcome of the Fiesta. Right after the doors closed last Sunday, she asked us if she did alright and if the affair was a success,” they continued. “That is genuine personal touch and concern,” the duo gushed. Imagine, a big star like Vilma, very concerned about how we did, wow, that was special. No wonder she is a respected and beloved three-term mayor. She truly deserves the awards and blessings that come her way. We would invite her again, they concluded. A non-singer but blessed with a charismatic pesonality, all Vilma had to do is to be seen by the huge crowds, talk and wave to them as she began to weave magic. Vilmania is very much alive and kicking. MORE DEAFENIING APPLAUSE…MOVE OVER, SISTER STELLA L…Then Senator Ralph spoke and concurred that his wife was nervous at first but as he guided her along the way, he was more than surprised. She learned fast. She seized the opportunity, rolled up her sleeves and just did her homework, with flying colors. He mentioned his achievements as Philippine Senator, and vowed to make a difference in Philippine politics. APPLAUSE. Autograph signing and photo ops with the famous couple capped the night. The whole world went gaga over Vilma and Ralph. Is this a good omen of things to come? Like that Palace in Manila? Just asking! Fast forward to August 20, Saturday. At around noon, the QueenStar, along with invited dignitaries, cut the ribbon and waved and said hello to her overjoyed audience. She was onstage. She vowed to come back in the evening with Senator Ralph. The musical numbers followed. Some bands played rock and roll. Aiza Seguerra wowed the crowds with her voice and guitar. She brought the house down when she sang her signature song, “Pagdating ng Panahon.” Then, it was a laugh riot session with Nannette Inventor, Jon Santos and Leo Martinez with their satire/spoof called Kiliti-kal Condition. They traded barbs, spoofed politicians and celebrities through seriocomic skit/songs, really a no holds barred session. If Mitch Valdez was in the cast, people would be asking for Maalox or Pepcid. It was Humorous, Inc., “kabag” included. Meawhile, at the VISION booth, the Vilma faithful began to form a queue – waiting for their idol to pop in and memorialize her precious autograph on memorabilia, from her 23-song CD album, to VISION tee shirts, magazine, blown-up photos and what have you. In their red VISION tee shirts, Alan, Jojo, Franco, Eric C., Mario and others were on red alert should pandemonium follow Vilmas live signing session in the booth area. The booth merchandise had good business (financial donations by the Vilmanians), proceeds of which were intended to help the needy and poor Vilmanians in the Philippines.- It is a virtual Vilma Santos retrospective: tee- shirts, mags, photos – made possible by Philippine VISIONaries Jojo Lim, Eric Nadurata and Co. Vilmanians from all over the U.S., young and old, professionals, ordinary people, weird or straight were vacillating whether to stay in line or troop to the stage area where Vilma may be next performer. The crowd was split. They mused. Hmmm She won’t sing definitely, but will she dance? Will she give a political speech? What will she wear? What will she say to the growing yet patient crowd? How does she look like in person? Is she still pretty? Does she still have that famous Vilma smile and karinyosa ways? Will she don a Darna costume or do a Sister Stella L. act? Anxious, Unlimited. I need my Xanax, please! It is half past eight? 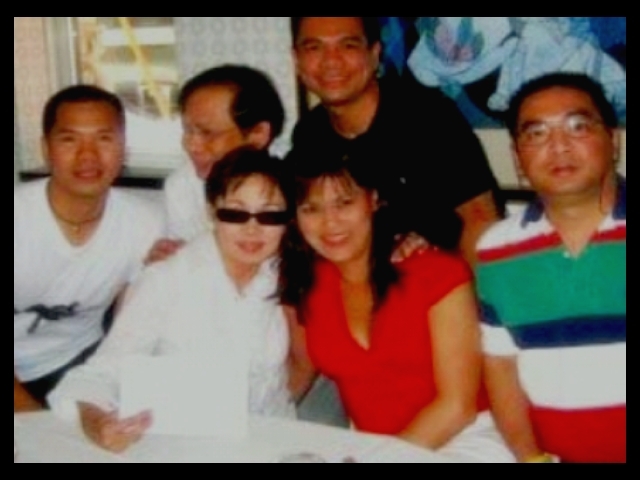 Do you know where Vilma Santos is? 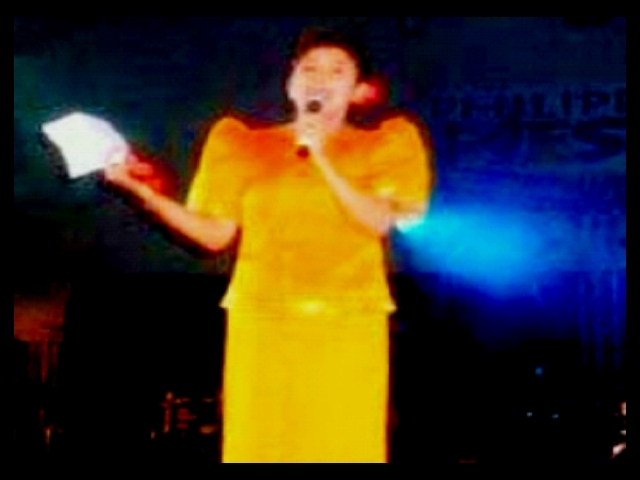 Was that her on stage wearing a terno ala Mayor Vi, complete with the Vilma hairdo with a flower and a hankie? Nope. That was impersonator par excellence Jon Santos. And then the moment of truth: Vilma and Ralph on stage, live! It was Vilma! all over again. “Bumabati po kami sa inyong lahat ng magandang gabi.” “OK,” she said, while holding a bouquet of yellow roses, while Ralph was smiling beside her. “Magtanungan portion po tayo.” Fans’ queries ranged from common to the sublime. Vilma: “My two sons are OK. Luis just finished college. He is wise with his money. He saves for the future. My youngest son Ryan is now eight years old. He loves acting…I have two more years to go for my third and last term for Mayor. I don’t have a political agenda at the moment. I did it through the help of God, constituents’ trust and cooperation. I am so blessed. Movies? I will just do one movie a year as time and my Lipenos will allow me.” Ralph: “Me for President? Maybe I’ll win if I was Christopher De Leon. No, seriously, our country needs your prayers and support. To run for President needs a lot of planning and consideration.” VST and Co.’s disco number, Awitin Mo at Isasayaw Ko was playing and the couple gamely danced the swing. Vilma waxed nostalgia of the glorious Vilma/VIP Dancers heydays. They had the audience at the palms of their hands. Are they the future President and First Lady? Just asking. 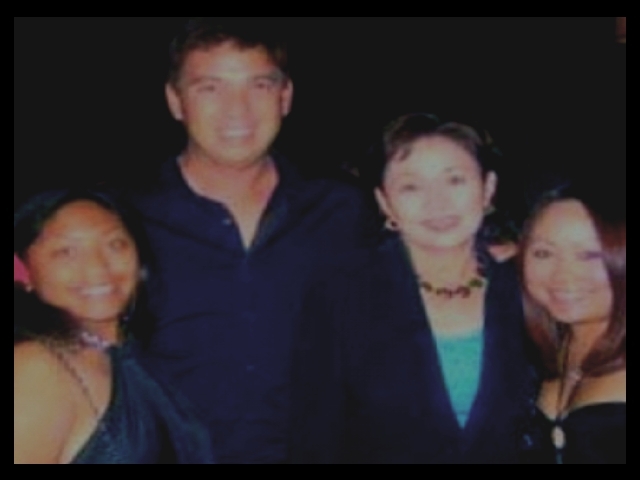 Then the 2005 Fiesta celebrity guests (Vilma, Aiza, Nannette, Jon and Leo) all went to the stage to sing Bayan Ko. The audience joined in. Patriotism, Pinoy style, anyone? It is time to connect with an enthused crowd. VTR’s and cameras in all shapes and sizes were capturing the moment. Handshakes with the fans. Security guards did their job well. They held the King and the Queen tight, like protective secret agents. Pray, tell me, are they the future President and First Lady? The lights went off onstage but the crowd was just getting to love Vilma more. Handshakes all over the place. Tears of joy flowed. Ate Vi! We love you! The security guards moved in to get Vilma. This entry was posted in ARTICLES and tagged ...And God Smiled At Vilma and Vilmanians. Bookmark the permalink.